A traditional Japanese tea ceremony can take more than four hours, but most people have just 15 minutes for a tea break. Here’s how to bring some ceremony into the everyday. The Japanese tea ceremony has many names. Chado (‘the way of tea’) is a popular one, as is chanoyu, which translates to ‘water for tea’. A full formal ceremony is an elaborate ritual that takes several hours. Everything must follow a strict protocol, from the size, layout and decor in the room, to the dress and movements of the tea-maker and the conversation and manner of the guests. It is very close to a scripted performance. In Australia we have a far less formal attitude towards tea and I doubt many of us have four hours to spare to conduct a tea ceremony, let alone the hundreds of hours to attend tea school to learn the art. Instead, there are elements of the tea ceremony we can transpose in the 15-minute tea break most of us can spare. A Japanese teahouse or tea room is laid out in a spare manner with tatami mats on the floor and minimal decoration. This is a deliberate way of minimising distractions so guests transition to a state of mind where they can leave their woes behinds and better appreciate the tea. You can follow this lead by creating a space just for tea. It might just be a corner of your desk or a tiny footprint in your kitchen where you have your kettle and cups, but decluttering that space before you make tea has a corresponding effect on clearing your mind. The permitted Japanese decorations are usually a seasonal flower and/or a scroll of calligraphy. You can decorate your space with flowers and/or a motivational quote as a nod to that. Chado requires the tea-maker to not only use the best tea—you may have heard of ‘ceremonial grade’ tea—but also to have practised tea-making to such a degree that the bowl of tea presented to guests is exceptionally well made. You don’t need ceremonial grade tea when you try this at home, nor hours and hours of practice, but it helps if you make an effort during the tea-making process. Use freshly drawn water and pay attention to it as it boils, and then as you pour it onto the tea to steep. These small acts of mindfulness give you a break from your work and allow you to enjoy the time you have to yourself as you do this. Many productivity experts say it’s this break that gives you renewed motivation and energy—even inspiration—afterwards. The Japanese have two ways of showing appreciation during a tea ceremony. One is an aesthetic appreciation where protocol compels guests to remark on the decor the host has chosen for the tea room, and then later the beauty and quality of the tea bowl. The second is in the conscious sipping of the tea: each guest has three sips to savour the tea before the bowl is cleaned and re-used for the next guest. 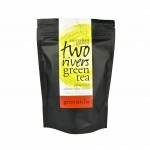 Of course you don’t need to re-make your tea every three sips but you can take the main principle from this practice. Take some time to admire your teapot or teacup (having a pretty set helps!) and then when the tea is ready to drink, pay attention to how it tastes, even if it’s just for the first three sips. The Japanese tea ceremony developed out of Zen Buddhism and it is this mindfulness and release of mundane concerns that carries through in the tradition today. 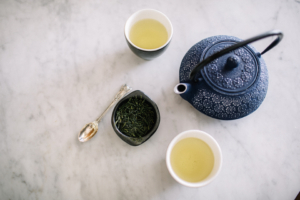 If you only have 15 minutes for a tea break, however, you can create a ritual that uses the same principles and benefit from the calm it brings—and you needn’t wear a kimono.